In a large skillet, melt butter over medium heat. Saute onions and peppers 5-7 minutes or until softened. Crack 12 eggs into large bowl and stir in salt and pepper. Add in cooked veggies and 1 cup cheese. Pour into greased 9x13 glass dish. Place tater tots into egg mixture and sprinkle with remaining cheese. 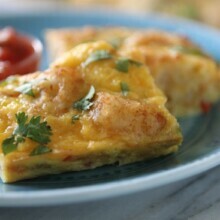 Bake at 350 degrees for 30-35 minutes or until cheese is melted and egg casserole doesn't jiggle. Top with cilantro and cut into pieces. Serve warm.